KeySmart Pro: Organize and locate your keys. 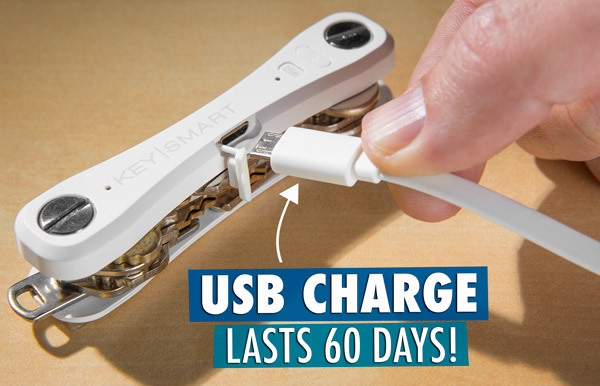 KeySmart, the clever key organizer, is now even smarter. The updated design still holds up to 10 keys in a compact form, but now it can also find your keys AND your phone! KeySmart Pro’s embedded Tile chip works as a locator so you’ll never lose your keys again. 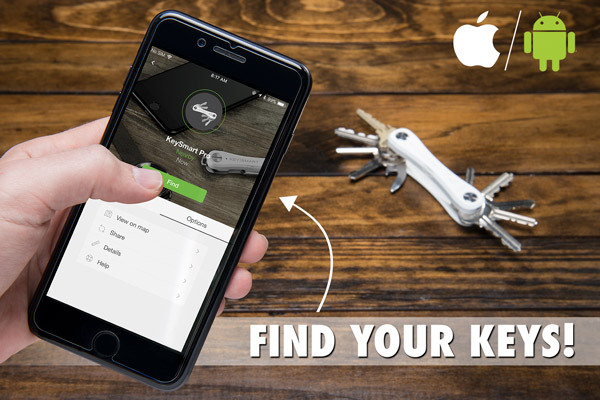 Connect it to your smart device and the free Tile app will track the location of your KeySmart Pro on a map. 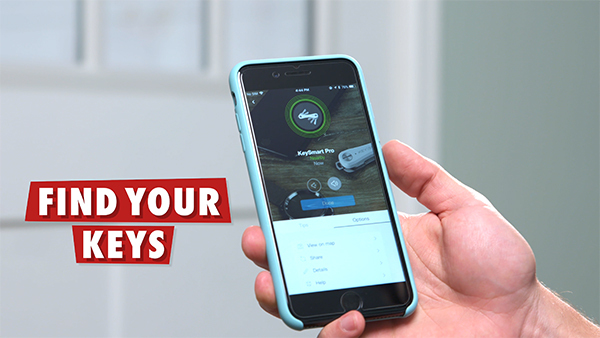 When you can’t find your keys in the house, use the app’s ring feature to quickly find your KeySmart Pro via sound. The Tile technology also helps when your phone (and, consequently, all hope) seems lost. Simply press the Tile button on your KeySmart Pro and your phone will start ringing even if it’s on silent. This sleek, pocket-sized accessory keeps your keys—and life—in order. Keeping your keys organized is helpful… as long as you can find them! 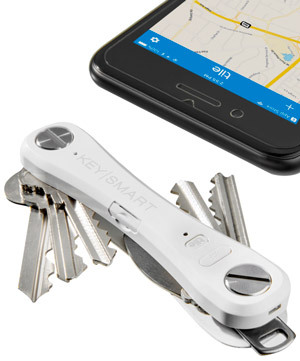 KeySmart Pro’s Tile chip pairs with the free app for your smart device to track the location of your keys. The app’s map will show you the general area where you left your keys and then make your KeySmart Pro ring so you can find its exact location within the general area. It saves you from freaking out if you dropped them during your day and also makes sure you’re not scrambling around looking for keys misplaced around the house. Make the last place you looked, the first place you looked. In today’s world, losing your phone feels tantamount to being lost at sea. How else will you connect with loved ones in case of emergency or post Instagram overhead cappuccino photos? 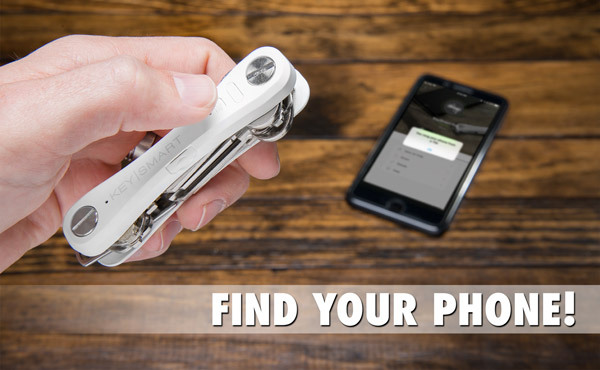 Not only can you use your phone to find your KeySmart Pro, you can use your KeySmart Pro to find your phone! Press the Tile button on your KeySmart Pro to ring your phone. Following the sound is much faster than turning over couch cushions and going through jeans pockets, allowing you to get out the door sooner. Finds your keys, phone, and sanity. KeySmart Pro is an organizational dream. 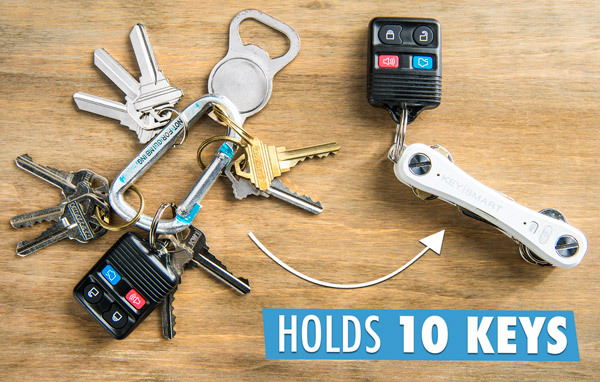 Not only does it find your keys and smartphone, it turns the jangly jumble on your keyring into a sleek shape. The KeySmart’s Swiss Army type design keeps your keys folded into a compact form that makes it easy to access individual keys. The slim design holds up to 10 keys while fitting unobtrusively into your pocket or small purse. It also includes a hook for your key fob. Expands to the size you need. The last thing you want at the end of a long day is to spend extra time fumbling with a lock in the dark. 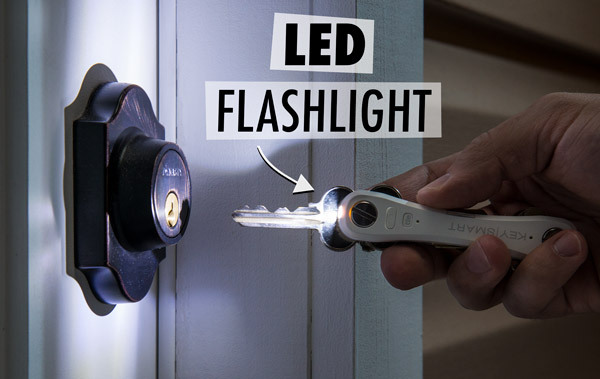 The KeySmart Pro has a built-in LED to shine light on your entrance. The small light can also come through in a pinch when you drop something on a dark sidewalk or need to go searching in your purse. Find your door in the dark. The KeySmart Pro is designed for everyday carry, so you might as well get some more use out of it! 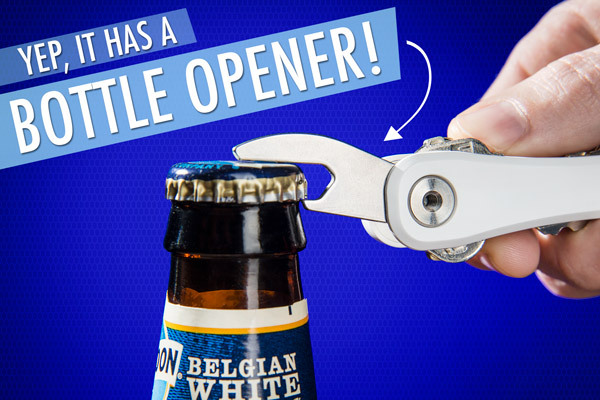 The organizer includes a removable bottle opener to make sure you’re prepared to crack open a cold one when needed. Just keep in mind that it won’t help you find your beer (but we don’t think you need help with that). Alert the authorities: you’ve been lifehacked. The KeySmart Pro’s convenient micro USB charger keeps you ready at all times. The device needs only two hours to fully charge (which you’ll know by the battery indicator light) and holds that juice for three months. You can travel without your charger and still rest assured that you’ll be able to find your phone and keys when needed. And if you do happen to run out of juice, it’ll still organize your keys and open your bottles just the same. Charge it and forget it! Question: Is it hard to add keys? Answer: The KeySmart Pro is designed to be easy to add keys. Unscrew the two thumb screws, lay your key flat, and screw the top back on. You can use the included 12 spacers as needed to even out your stacks. Question: How does it compare to the original KeySmart? Answer: The KeySmart Pro is slightly thicker than the original and is made of plastic instead of aluminum. In addition to the Tile tracking features, the KeySmart Pro has an added LED flashlight.